We are a newly founded club on the hunt for members, of all ages, abilities and skill sets. 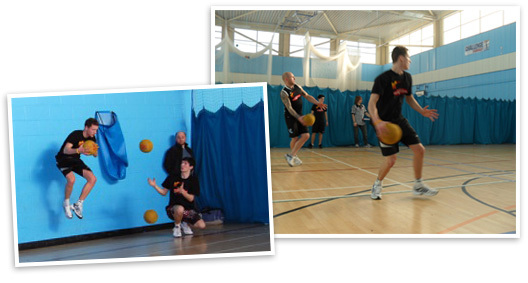 Dodgeball is one of the fastest growing sports in the country and we want you to get involved! The fast paced game features 6 players on each team, with 3 balls in play at any time. The object of the game is simply to eliminate the opposition as quickly as possible; each game lasts for 2 minutes, and you can get rid of an opponent by throwing a ball and hitting them out, or by catching one of their throws. The sessions at Lutterworth Dodgeball Club are taken by two international players, Brett Koenig and Simon Jones, who have both represented England on multiple occasions. The founders play for 'The Meteors'- a product of the Lutterworth Dodgeball Club- one of the top 5 sides in the country. The beauty of Dodgeball is that it requires no specific skill set, the sport is available to people of all abilities and ages. Within the club there is a real friendly, try your best ethos, and you can take training as seriously as you want, and if you begin to find yourself getting competitive, you may even fancy playing in some nationwide tournaments! Dodgeball is a really addictive sport that is great for fitness, meeting friends and staying healthy. Training takes place on Tuesday nights at Lutterworth Sports Centre from 7 - 8pm, and your first session is completely FREE. If you want to come again then a charge of £2 applies, but remember, your first session is completely FREE.